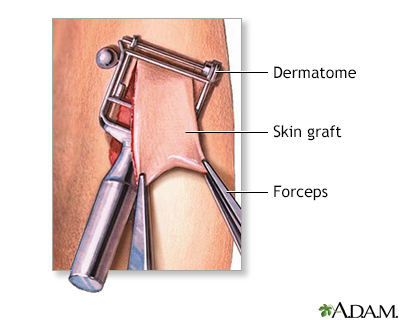 Specific surgeries that may require skin grafts for healing to occur. The most common sites of harvest for skin grafts are the buttocks and inner thigh, areas which are usually hidden and therefore cosmetically less important. While the patient is awake, sleepy (sedated), or deep asleep and pain-free (local anesthesia or general anesthesia), healthy skin is taken from the selected donor site on the patient's body using a dermatome (skin-cutting instrument). The graft is carefully spread on the bare area to be covered. It is held in place either by gentle pressure from a well-padded dressing or by a few small stitches. The raw donor area is covered with a sterile nonadherent dressing for 5-7 days to protect it from infection. The donor area heals on its own within 2-3 weeks. 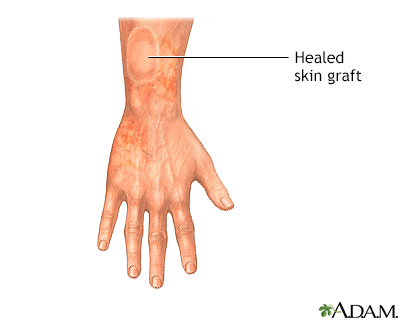 Skin grafts usually heal with little scarring, and often look similar to surrounding normal skin.